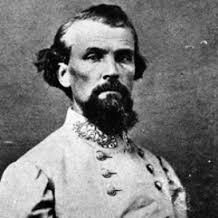 Nathan Bedford Forrest (1821-1877) was the leader of the Ku Klux Klan. A former Confederate cavalry general and slave trader, Forrest became the KKK's "first grand wizard" or leader-in-chief. Forrest is most likely to hate the future because he would see African Americans running around all over the place, and he would most likely either break down into hysterics that his group failed him or try to throw them all into slavery and kill whoever resisted (probably the latter).